Helen Borowski Nizol (1900-1935) appears to be my 1st cousin 2x removed. I only learned about her after I dug deeper into the the Polish branch of my family tree. She died a young mother (34), just like hew own mother, Martha Pawlowski Boroski (1880-1911), who died at 31, when Helen was only 10 years old. 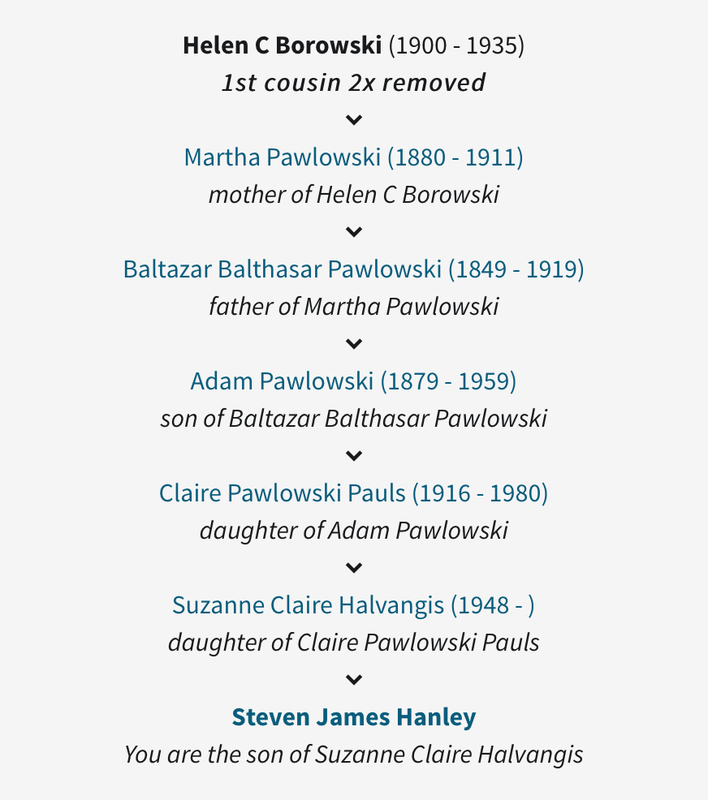 Helen and I share a set of direct ancestors, her grandparents and my 2nd great grandparents: Baltasar Pawlowski (1849-1919) and Marie Zuchowska Pawlowski (1851-??). I have not seen a picture of Baltasar, but I am fairly confident that this is a photo of Helen's grandmother (my 2nd great grandmother), Marie. Helen's mother (Martha) and my great grandfather, Adam Pawlowski (1879-1959) were siblings. Here is a chart of the relationship between Helen and me. Helen and my grandmother, Claire Pawlowski Halvangis (1916-1980) (the subject of my very first post at The Psychogenealogist!) were 1st cousins. In 1910 she lived at 745 Palmer Ave. in Detroit, MI with her parents, 3 siblings, and a cousin. Because of the city wide address renumbering that took place in Detroit in 1921, the address after 1921 would be 2657 Palmer. Those houses have long since been razed and the lots now stand empty. Her mother Martha died in 1911. I believe this to be Martha's grave stone at Mt. Olivet Cemetery in Detroit. I took this photo when I visited Mt. Olivet last summer. Dozens of my ancestors are buried there. In 1920 Helen was still living with her father, his 2nd wife (Regina Chrylewicz Borowski 1880-1961), 3 full siblings, and 4 new half siblings. They were living at 742 Harper in Detroit (2646 Harper after the 1921 renumbering). It is likely that she lived there at least a few years earlier as there are a few Detroit City directory listings for this family at that address during this time. On October 12, 1920 Helen married Walter (aka Ladislaus) Nizol in Detroit. By 1930 Helen and Walter were living with their 3 children (a 4th would be born in 1931) at 20015 Harned Ave. in Detroit. Helen died on April 4th, 1935 due to "generalized exudative peritonitis". (Note what I believe to be an error in her mother's maiden name on the death certificate below. It should be Martha Pawlowski, not Puchalski. The 20015 Harned address, however, matches up with other known information). A Requiem high mass was sung for Helen on Monday, April 8th, 1935 at the now long since abandoned St. Rita's Catholic Church not far from the Nizol's home. St. Rita's was likely Helen's family church. I found this youtube video of an urban explorer documenting the sad condition of this abandoned building in one of Detroit's more blighted areas. Uploaded by Random Axe on 2014-02-26. St. Rita’s Church in Detroit, MI. Helen left four young sons when she died: Walter (13), Raymond (11), Jerome (8), and Richard (4). In 1940 all four Nizol sons and their father, Walter, were living as boarders with a Dombek family in the same neighborhood. The Dombecks had three children of their own. Interestingly, Jerome Nizol ended up marrying the youngest of the Dombeks, Irene. They were both around the same age (about 12 in 1940). In the several hours I spent writing this up. I went from having no knowledge of this family to having about 10 story lines I would like to follow up on. How did she adjust to losing her mother at such an young age? There are likely direct decedents of Helen alive today. How can I find them to help me fill in the gaps to her story? How did the relationship develop between Jerome and Irene? How long did their families live together? Did Helen's husband, Walter (Ladislaus) remarry? Are their photographs of Helen that exist somewhere? Though cousins, did my grandmother and Helen really know each other? Were their families close? What do you think, feel, and wonder about as you read these details of Helen's story? This is the 27th of 52 weekly posts planned for 2018. It was inspired by the #52Ancestors writing challenge issued by professional genealogist, Amy Crow Johnson. The challenge: once a week, for all 52 weeks of the year, write about a relative in your family tree. Newer PostThe Psychogenealogist Pic of the Week (#80) - "A Line from West York"